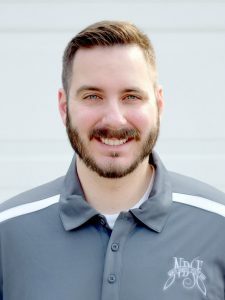 MINOT, N.D.—The North Dakota State Fair extends a warm welcome to new Marketing Director Mr. Vince Azzarello. Vince Azzarello transitions to the State Fair from a career in radio. Since 2005 he has worked in all facets of the radio industry. Along with his years of radio experience spanning from Indiana to Oregon, since moving to Minot in 2010 he has invested in the community in many ways. From 2012 to 2015 Vince volunteered as a marketing specialist and emcee for Minot’s largest Christian music festival, Rock The Leaves. During his time with Rock The Leaves, in 2013 award winning rock group Switchfoot brought in the largest attendance to date. He excels as a speaker, and has been invited to speak at Beardstock, a beard and music festival, Child Evangelism Fellowship, and various concerts. Vince has also pursued his passion of disc golf, creating the Minot Disc Golf Club in 2014. The league has grown to over 30 members and holds tournaments that bring disc golfers from around the state to Minot. The North Dakota State Fair is very excited to have Vince on board as the Marketing Director. If you would like to contact him, please call (701) 857-7620 or via e-mail at ndsf@minot.com. Previous Post Previous post: Vendors Shine at the 2017 North Dakota State Fair!